It’s time to look at a pretty mean spirited film where you will wonder how it made it through to production. It doesn’t do anything right and so you can use this as a counter to the debate that modern films aren’t as good as the old ones. Just mention this film and fans of the classic era will freeze for an instant before telling you that this one can’t be counted. The film is about an old lady who has trouble walking. She gets in her indoor elevator which connects two floors but then gets stuck when the power goes out. That’s when some crooks break in to wreck the place and the lady realizes that the elevator may not have been such a good idea. That’s the general plot which is rather small but the film tries unsuccessfully to stretch this out for the full duration. As such the film’s pacing is incredibly slow and overstays its welcome from start to finish. The writers clearly had no idea what they were doing and the director was likely drunk with how often the camera angles switch. There was no focus in the film and if the script had been turned into an essay it likely would have gotten an F.
If you’re wondering what the point of the film was, it was a weak attempt to try and show that all humans are fundamentally evil. It’s just done in such an over the top and artificial way that you’ll be left wondering why fanfics are written better. The film goes out of its way to step on as many land mines as possible like throwing in animal violence for no possible reason. It’s like the film was just blindly throwing darts to add in filler scenes to pad out the time. Make no mistake, we get a bunch of filler scenes here. The film is fairly violent and gritty throughout. It likes showing how the people are ignoring the lady’s plight over and over much like a comedian who has to repeat the same joke over and over to try and get a laugh. The repetition is astounding and if you cut out the fluff you could effectively adapt this plot in half the time. As to why you would ever want to adapt this plot, that’s another question entirely. Now what could have saved this film? Well, first you throw out the script. Next you add in the fact that the character is in a mansion in the middle of nowhere to add some actual credibility to why nobody checks the alarm. Add some extra floors so the elevator doesn’t seem pointless and you’ve already got a more intelligent film. It would probably still be pretty terrible with this plot though so add some robots and an alien invasion story to the mix and then maybe this film will show some promise. I do miss the old antique stores though where you would go to a shop and trade things in for big bucks. Now we have Amazon and EBay which are more effective but considerably less personal. You don’t get to have the cash in your hand right away unlike in this scenario. Honestly I probably wouldn’t end up trying it out even if it was still here but it would be an interesting place nonetheless. Overall, This was a terrible film. As one critic said “The picture should be burned,” It only exists to try and say how warped society is but you could just watch the news for that. This movie fails as a film and it fails as entertainment. The only way to win against this film is simply not to watch it. Fortunately the film lets you know how terrible it is right away from an early scene so you can mentally check out at that point. Of course your best tactic is still to pop in something with quality instead like a classic episode of Dragon Ball Z. Nothing beats an episode of seeing two characters power up to put everything into perspective. 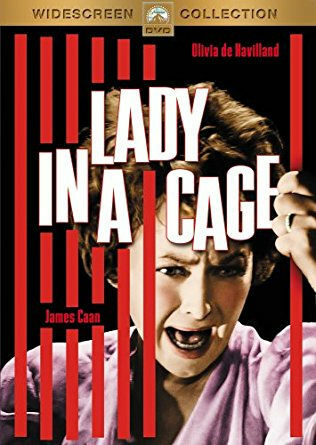 This entry was posted in Live Action Movie Reviews, Live Action Movies, Reviews and tagged Film Review, Lady in a Cage, Movie Review, Review, Thriller, Tragedy by dreager1. Bookmark the permalink.